You can find our Song List here. Kipahulu honors the southern tip of Maui, most frequently referred to as "the Hana side". The song speaks lovingly of the lush mountain region which spills into a sea of fragrant lipoa, and how relaxing it is to be there. Keaolani loves to visit this region of the island, and this song holds a special place in our hearts as we are all so familiar with the many beauties of Kipahulu. 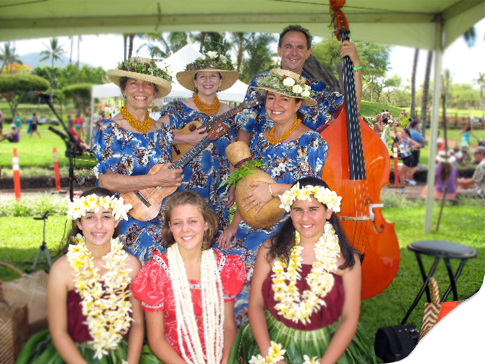 Hula Lolo is a prime example of the classic "Hapa Haole" style which blends western music sensibilities with Hawaiian themes. The Hawaiian word "lolo" translates as "crazy", but really, this is just a fun-loving song that celebrates the hula, and even gives mention to three very traditional Hawaiian classics. Agnes Auld is reported to have been given her Hawaiian name (Leilehua Kaonohimakaokalani) by Queen Lili'uokalani at her one-year baby lu'au. She wrote Hula Lolo with her husband, Norman Hendershot, probably in the 1930's. Because one of Keaolani's main missions is to carry forth the music, arrangements and stylization of Kahauanu Lake, it's always something special when we perform one of his compositions. Uncle K. wrote this as an English language companion to Maddy Lam and Mary Kawena Pukui's "Ka Lehua I Milia". Both songs speak of a love affair "as if" it were between the misty rain and the lehua blossom. In this particular rendition, our teacher, Walter Kamuala'i Kawai'ae'a is playing the ukulele with Johnathan Dreschler on bass. Pamela Polland, band leader for Keaolani, is the featured vocalist. Listen to the song here.